Living a Fit and Full Life: Corner Bakery Cafe's Fresh Flavors Menu is Here! Chicken, strawberries, blueberries, bleu cheese and candied pecans on greens with strawberry vinaigrette dressing. Chicken, smoked bacon, avocado, tomatoes, leaf lettuce, cheddar and Swiss with mayo on whole grain harvest. Corner Bakery Cafe's Fresh Flavors Menu is here! I had the pleasure of trying Corner Bakery Cafe's Berry Pecan Salad and Chicken Bacon Avocado Club Sandwich and boy were they delicious! I absolutely loved how fresh the ingredients were and how terrific the ingredients paired together. I honestly wasn't too sure I'd like the Berry Pecan Salad but I would say this is one of my all time favorite salads. The berries, pecans and chicken and greens were the perfect combination and the dressing was so good. Just typing this has me craving another one of these salads! 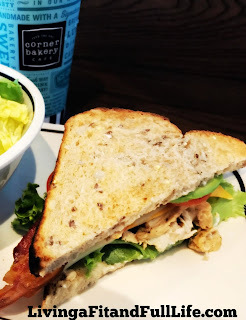 Corner Bakery Cafe's Chicken Bacon Avocado Club Sandwich is also amazing! Each bite had the perfect amount of flavor and I love that the bacon was cooked to perfection. Both the salad and sandwich are perfect for lunch or dinner and I highly recommend them! Click HERE to find a Corner Bakery Cafe near you! Click HERE to learn more about Corner Bakery Cafe! 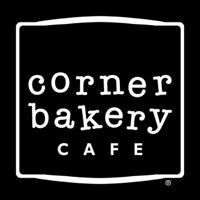 Follow Corner Bakery Cafe on social media!